Proprietary Name: Nicotine Transdermal System What is the Proprietary Name? Non-Proprietary Name: Nicotine Transdermal System What is the Non-Proprietary Name? 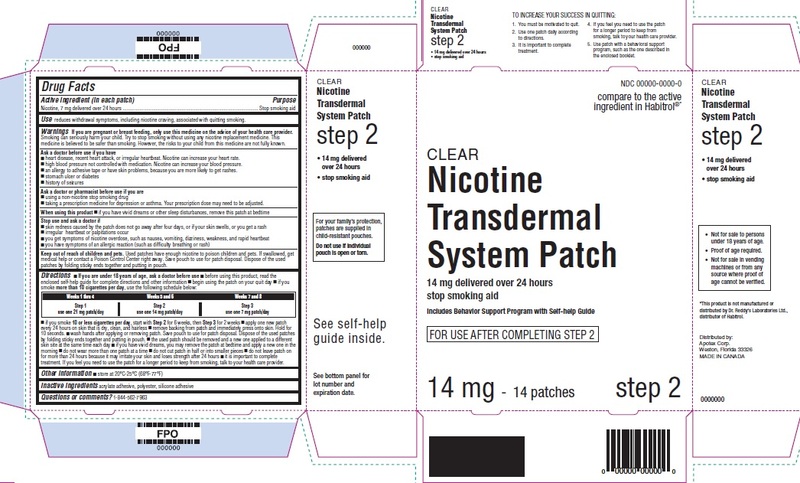 Nicotine Transdermal System with NDC 37808-460 is a a human over the counter drug product labeled by H-e-b. The generic name of Nicotine Transdermal System is nicotine transdermal system. The product's dosage form is patch, extended release and is administered via transdermal form. FDA Application Number: ANDA074612 What is the FDA Application Number? Using a non-nicotine stop smoking drugtaking a prescription medicine for depression or asthma. Your prescription dose may need to be adjusted. Used patches have enough nicotine to poison children and pets. If swallowed, get medical help or contact a Poison Control Center right away. Save pouch to use for patch disposal. Dispose of the used patches by folding sticky ends together and putting in pouch. If you are under 18 years of age, ask a doctor before use before using this product, read the enclosed self-help guide for complete directions and other informationbegin using the patch on your quit dayif you smoke more than 10 cigarettes per day, use the following schedule below:Weeks 1 thru 2Weeks 5 and 6Weeks 7 and 8Step 1Step 2Step 3Use one 21 mg patch/dayUse one 14 mg patch/dayUse one 7 mg patch/dayif you smoke 10 or less cigarettes per day, start with Step 2 for 6 weeks, then Step 3 for 2 weeksapply one new patch every 24 hours on skin that is dry, clean and hairlessremove backing from patch and immediately press onto skin. Hold for 10 seconds.wash hands after applying or removing patch. Save pouch to use for patch disposal. Dispose of the used patches by folding sticky ends together and putting in pouch.the used patch should be removed and a new one applied to a different skin site at the same time each dayif you have vivid dreams, you may remove the patch at bedtime and apply a new one in the morningdo not wear more than one patch at a timedo not cut patch in half or into smaller piecesdo not leave patch on for more than 24 hours because it may irritate your skin and loses strength after 24 hoursit is important to complete treatment. If you feel you need to use the patch for a longer period to keep from smoking, talk to your health care provider. 1. You must be motivated to quit. 2. Use one patch daily according to directions.3. It is important to complete treatment. 4. If you feel you need to use the patch for a longer period to keep from smoking, talk to your health care provider.5. Use patch with a behavioral support program such as the one described in the enclosed booklet.